Veteran PA Rando Bill Fischer kept his string of PA events alive by completing a course check-out ride on November 19. His notes along with a few organizer notes have been incorporated in an updated cue sheet for the event which is posted on the website. Please be sure that you download/print the latest version indicating "11/20, pre-ride updates." The route is in good shape and the cue should be easier to follow than before, especially for those relying on the old standard CPS navigational standard. As always, riders should watch for loose gravel on the inside of corners and never outride their guardian angel on descents. Please note that there is a half-mile section of gravel road on this course which is marked on the cue sheet. This section is easily passable, but riders will want to exercise caution as there are a few areas of deeper stones that could cause problems for the inattentive. Both Bill and I rode this stretch on Saturday without incident. Caution is also advised at mile 77.6 along Georgetown Road. Repairs of the "buggy track" there have resulted in some patches with square-edges running in the direction of travel. They are just large enough to catch a bicycle tire and mis-direct an unwary cyclist. The road is slightly uphill here where speed should not be much of a factor. Still, I'd prefer to avoid any spills into the vehicle lanes on Georgetown Road. This type of buggy track repair is very common in Lancaster County so riders should always be careful when riding along the edge of these repairs. Details and event registration for the final R12 brevet of 2016 have been on the website. Registration will remain open through 5pm on December 1. Please note that the starting time is 7:30 am to avoid having to start in the dark. This route offers a different twist on Lancaster County by looping generally north and south from a central start-finish location. The route is laid out generally as a figure-8 and returns to the start location after 60 miles providing a safety bail-out should weather conditions or rider conditioning take a turn for the worse. No one abandoned in February, so I'm hoping for better weather and a repeat 100% completion rate. A few tweaks based on rider feedback and a desire to make the route a bit less susceptible to bad weather have been incorporated. You will find the updated route here. Breakfast is available nearby at the Oregon Dairy Restaurant, approximately 1 mile north of the start location along SR 272. The food is good and plentiful and there's even a breakfast buffet. The baked oatmeal is one of my favorites. The restaurant opens at 6am which leaves ample time for breakfast and to make you way to the start. Please note that the starting time is 7:30 am to avoid having to start in the dark and allow plenty of time for a hearty breakfast. Our finish controle will be at the Highland Pizzaria in the shopping center. It offers a decent selection of food for hungry riders and an excellent selection of beer for those wanting a few liquid carbs to assist in post-ride replenishment. Our own CJ Arayata is set to welcome you to the finish, so look for him when you arrive. Parking is not abundant at the start finish area, but there should be enough to manage. We will be staging for the start at the north side entrance along Landis Valley Rd under the sign with the clock/thermometer. You should park in that general area away from the store fronts. Carpooling will help. There is ample additional parking at the Landis Valley Farm Museum (where the February event started) on the opposite side of Oregon Pike which may also be used. A course check-out ride of the updated route is scheduled for the 19th, so check back here for any updates to the cue sheet. Finally, as the end of the year approaches you should take the time check your RUSA and PA Randonneurs membership status and renew, if necessary. You can check your RUSA status at: https://rusa.org/cgi-bin/memberrenew_GF.pl The PA membership list is posted on website. Results will be submitted in a couple of days to RUSA. Thanks once again to the well-oiled brevet team of Bill Olsen, Guy Harris, and Chris Nadovich for making this one happen. They make it look easy. Fall brevets are always tricky. Events are scheduled over a year in advance making it anyone's guess as to what weather riders will face. Thankfully, riders on Saturday's combined Le Retour du Stillwater and Milford events enjoyed just about as nice a day for cycling as one can ask for in early November. Consider this: first finisher Chris Maglieri completed this event in 2013 with a finishing time of 8:38; seven riders besides Chris bested that time on Saturday. Apparently cool weather brought out the best in several randonneurs. More important to the organizers is that every rider who left the Milford Bakery in the morning returned within the time limit for a 100% completion rate on both events. What a fantastic day to be on a bike! I met a few more PA Randonneurs and we had a glorious time on the Retour. My wife actually came to start and the finish (calling her my Uber-Rando now) which gave her the opportunity to meet and chat both before and after the ride, which was highly beneficial since she now has a few faces to go with the names I talk about after these events, but perhaps more importantly she can learn that i am not the only/most crazy person out there. The pre-ride report was right on target with everything; Shades of Death had the worst surface of the entire day, excluding I suppose the 0.2 mile dirt stretch on Old Cemetery Road. You know you have left Tranquility behind when you get on Shades of Death Rd. Thanks to Bill and Chris at start/finish, and thanks to the Milford bakery folks for a great place to start! Thanks to you, Bill, and all the other volunteers that helped make Saturday’s ride another fantastic randonneuring experience. 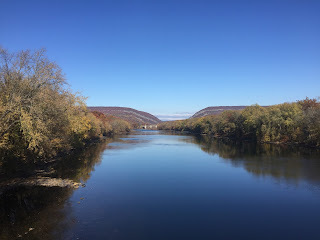 The route was beautiful, especially along the Delaware River. The view from the top of Riverton road was amazing. I’ve ridden the stretch between Milford and Portland a lot in the past months and each time I discover something new. James recently wrapped up an R12 and appears to be intent on going for another and perhaps a K-Hound award as well. Next up is a return to Lancaster County for a reprise of the Little Britain brevet. Event details will soon be posted. I've tweaked the route a touch based on careful notes from February's running. There remains one small section of gravel road and most of the big hills, but the cue sheet should be easier to follow and we will bypass Nottingham Road (SR 272) in the interest of an improved ride experience. A pre-ride is planned for later this month. I'm talking to the weather man in an effort to keep ice out of the picture. The PA membership list is posted on website.